Adidas Samba sz 11 clean. Condition is Pre-owned. Worn out a few times near mint condition and clean. Shipped with USPS Priority Mail. Only shipping to continental US. BRAND NEW IN THE BOX! Size 9.5! I will ship within 48 hours of receiving CLEARED payment! I only ship internationally through the eBay shipping center. Please leave positive feedback so I know you are satisfied! If you are not satisfied, you must contact me within 2 days of confirmed delivery. I will do my best to resolve any problems, but refunds will only be issued if the item description is vastly incorrect! Please let me know if you have any questions! Thanks for looking and have a good day! BRAND NEW IN THE BOX! Size 10! I will ship within 48 hours of receiving CLEARED payment! I only ship internationally through the eBay shipping center. Please leave positive feedback so I know you are satisfied! If you are not satisfied, you must contact me within 2 days of confirmed delivery. I will do my best to resolve any problems, but refunds will only be issued if the item description is vastly incorrect! Please let me know if you have any questions! Thanks for looking and have a good day! ADIDAS ORIGINALS SAMBA OG MENS SHOES SIZE 11US. Condition is Pre-owned. Shipped with USPS Priority Mail. A little dusty from just sitting. Only worn approximately 20 times. in very good condition. Adidas silver Samba. Condition is New but slightly misshapen in pics from being tucked away. Shipped with USPS Priority Mail. Adidas Samba Og Mens White Leather Lace Up Sneakers Shoes. In excellent shape - newly used to small for me so make an offer. These are true to size. Condition is Pre-owned. Shipped with USPS Priority Mail. 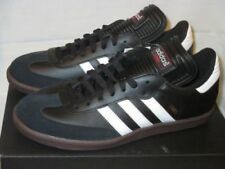 Adidas Samba Black Leather White Stripes Soccer/Casual Shoes Size 9.5 Men Sambas. Condition is Pre-owned. Shipped with USPS Priority Mail. Adidas Samba Hemp Size 8.5. Condition is Pre-owned. Has wear near ankles and inside left sneaker. Inspect pictures carefully and ask me anything. Dropped price to reflect. Men's Adidas Samba Indoor Soccer Shoe Black White Size 8. My son used them only 3 times. They are in mint Condition. Shipped with USPS Priority Mail. Adidas Samba. Soccer Shoe. Gray Leather. This is a pair of classic Adidas Samba indoor soccer shoes, size 5 U.S., 4.5 U.K., in good, pre-owned condition with no defects and lots of life left in them. 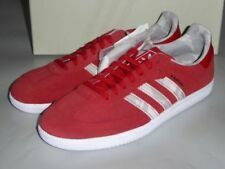 Adidas Samba Classic Shoes 034563 Size 8 US. Length (heel to toe)-12.25". Shoes are in pre-owned condition and show signs of light wear. Heels and toes of both shoes show light dirt. Shoes are in otherwise good condition. Shoes have light use but are in excellent pre-owned condition. Buy it now is a pair of adidas Originals Samba MC Shoes Reflective Black/Metallic Silver Mens 10 NEW. This item is new in the box, see photos. these shoes is $29.99. They will be shipped via priority mail and delivered within 2-3 business days and you will be provided a tracking number as well. Length of shoe - 9 1/2". Shows light wear. See pictures. Vintage Distressed Adidas Samba 85 2007 Size 11.5 Unique summer shoes. Condition is Pre-owned. Shipped with USPS Priority Mail. Ships the morning after payment received. Email with any questions. Thanks for looking. Adidas Samba Vulcanized Men’s Brown Leather Shoes Sneakers Sz 10.5. Condition is Pre-owned 9/10 Shipped with USPS Priority Mail. Men's Adidas Samba Classic Soccer Shoes Size 12 2018. Only worn a few times. Condition is Pre-owned. Shipped with USPS Priority Mail. 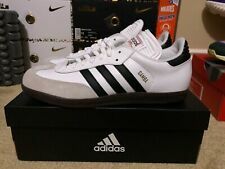 Adidas Samba Classic White Athletic Lifestyle Casual Shoes Mens Size 13. Condition is Pre-owned. Shipped with UPS or Fedex regular. Great condition only worn 10-12 times. Very good condition comes with original box! SKU# :D97211. Rubber outsole. TRACTION & DURABILTY Stay-cool lining. ADIDAS SAMBA Classic Black Football, Soccer Shoes Men's 7.5 US. Condition is Pre-owned. Shipped with USPS Priority Mail. Some dents/holes in insole due to pivoting. Some cracked and peeling leather but still very durable tough shoes. Great for indoor. Adidas Samba RM BD7537 Size 12 US Condition 9.5/10. VNDS. Worn once This item is basically new. The sneaker is made of really premium materials and uses encapsulated BOOST in its midsole for that additional comfort. The item haa been stored in a smoke-free and pet-free environment. Mens US 10 Addidas Samba Indoor Soccer Or Skateboard Shoe. Condition is Pre-owned. Shipped with USPS Priority Mail. In fair shape. Something melted part of the tongue on one shoe. (SEE PHOTO 4) Otherwise shoes are in good shape. Soles are in great shape. Minor scuffs in leather. Feel free to message me if you have any questions. Adidas Originals Samba RM Boost BD7539 Black/White Size 9. Condition is New with box. “SAM3A” edition with Boost bottom. Shipped with box (not double boxed). Sold as is. Smoke and pet free home. Shipped with USPS Priority Mail. Originally designed for indoor soccer or futsal, the adidas Samba has come off the court and onto the streets. It's a favorite among insiders for its low profile, long-lasting sole, and comfort. If it's good enough to be dribbling and kicking on the court, it'll handle a quick commute without breaking a sweat. The style has become iconic among soccer fans who love showing their love for the sport no matter the occasion. But even those who don't know a bicycle kick from a scorpion kick can appreciate adding a little bit of athletic edge to their outfits. Men's magazines even say that these classics are good to go with a suit. Whether they will fly in the office is debatable, but they will certainly make a statement. eBay has provided more information about this product above and is not affiliated with or endorsed by adidas. The adidas Samba is a men’s athletic footwear line featuring a black leather exterior with white stripes and a tan gumsole. Adidas Samba was introduced in 1950 and created to help soccer teams train on icy ground. They have made many appearances in movies, television, and music videos since the 1960s. Did soccer players wear Sambas in the past? Soccer teams used the Sambas as soccer shoes to train on icy ground. Since soccer season in Europe runs from fall to spring, teams played in many weather conditions. In winter, the outdoor fields become icy and hard. The Samba gumsole features a suction designed to help players keep their footing while they acclimate to the field condition. What media has the adidas Sambas been featured in? West Germany wore a restyled version of the Samba when they won the World Cup in 1954. Ewan McGregor in the movie "Trainspotting." Owen Wilson in the movie "You, Me, and Dupree." Shia LaBeouf in the movie "Transformers: Revenge of the Fallen." The movie "Remember the Titans" has each football player wearing Sambas. Ashton Kutcher in the movie "Valentine's Day" and the TV sitcom "That '70s Show." Adrian Grenier in the TV show "Entourage." Steven Yeun in the TV show "The Walking Dead." Classic M: The original black, white, and tan design. 62: The 62 features a felted toe and an extra toe cap. It comes in many colors and has been reissued several times. Super: These sneakers feature similar styling to the 62s but with a larger toe cap and an extra-long tongue. They have been made in suede, corduroy, and leather. 85: This sneaker features a striped outsole and large toe cap. JP: This style features a pointed toe with horizontal stitching. NUA: The NUA has a fatter sole, heel and toe caps, and thicker stripes. These were often issued to commemorate different teams and soccer events. MTL: This limited-edition sneaker features gold accents, crackled black leather, and a purple sole, all in the original Samba design. 523: This limited-edition sneaker was part of a pack of seven reissued classics. The 523 replicated the original Samba but with leather and a blue outsole. OT-Tech: This all-black spin on the original sneaker features a felted toe and dagger-like teeth on the white midsole with a blue heel.